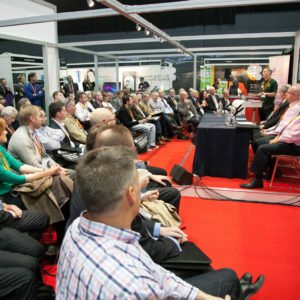 A debate on the future of oil heating was held at last month’s Oil & Renewable Energy Show. On the panel were OFTEC’s Jeremy Hawksley, Mark Askew from the Federation of Petroleum Suppliers (FPS), Brett Hale of Riello and Peter Carter from Atkinson Equipment. Chairing the debate was Jane Hughes, editor of Fuel Oil News. With a packed seminar theatre and several people keen to give their views, this debate could, and should, have lasted far longer. To be expected, the panel’s views on the future of oil heating were very diverse and in some cases, totally opposing. Explored by both OFTEC and the FPS, current threats to oil include its price, its exclusion from new build properties under the Code for Sustainable Homes, bioliquids being ruled out of the Renewable Heat Incentive(RHI), the possibility of an extra tax and the RHI subsidies. Whilst Riello sees oil working in partnership with solar thermal and heat pumps, the company believes that without bioliquids, oil does not and will not have a green credential to fit into the future energy mix. Whilst agreeing that our industry should work with renewables – particularly those unable to supply hot water all year round – Atkinson Equipment made a plea for our industry not to tinker with fuel and equipment that is tried, tested and trusted by its customers. Peter Carter argued that happy customers would give the industry greater leverage, if and when the government decides to ban oil heating altogether! In 2001, kerosene sales were at 2639 kilotonne (kmt), last year this was down to 1973kmt. The government predicts that by 2020, 500,000 homes will have switched to alternative technologies aided by the RHI. “One of oil’s problems is that it’s so damn good,” said Andy Townsend in Oil Installer Summer 2012. Now also working with renewables, Andy pointed out that we “can’t just turn the oil tap off”. But, the question the industry does need to ask now is, if more than a quarter of heating oil customers have stopped using kerosene by 2020, how long will a declining market remain attractive to refiners, wholesalers and fuel distributors? This debate is certainly to be continued….. In the meantime your views on the ability of the oil heating market to resist the threats are invited jane@oilinstaller.co.uk. THE FUTURE OF OIL HEATING JEREMY HAWKSLEY from A&D Publishing Ltd on Vimeo. THE FUTURE OF OIL HEATING MARK ASKEW from A&D Publishing Ltd on Vimeo. THE FUTURE OF OIL HEATING BRETT HALE from A&D Publishing Ltd on Vimeo. THE FUTURE OF OIL HEATING PETER CARTER from A&D Publishing Ltd on Vimeo. THE FUTURE OF OIL HEATING Q & A from A&D Publishing Ltd on Vimeo.